KwiltArt’s owner and designer, Kathleen Andrews, has been designing, writing patterns, teaching and lecturing for many years, and is also a project designer for Anthology Fabrics. She left the quilt world for a few years to become an award winning race car driver, but is now driving full force back into the quilt world and has introduced a new and dynamic line of patterns (currently 13 patterns). One of KwiltArt’s newest patterns is “Spin Out” (luckily something she never did racing!). It is a striking optical illusion made very simply with freezer paper templates and a bargello type stair stepping of colors. You also create the illusion of circles without curved piecing. 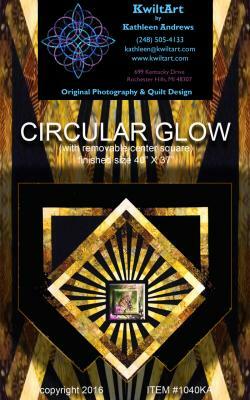 Another new pattern is “Circular Glow”. This pattern features a removable center using “sticky for fabric Velcro”. The pattern shows a photo printed on fabric and mounted on fusible foam for the center, but you could use anything you like to showcase something special (photo, quilt block, embroidery, etc), and you can change it whenever you have something new to feature in the center. This is also a simple pattern using strip piecing and freezer paper templates and also creates the illusion of circles without curved piecing. Be among the first to have the newest patterns in the KwiltArt collection!!!!!!!!!!!!!!!!! !